Is the ‘displacement’ of the Parthenon Marbles really a ‘creative act’? 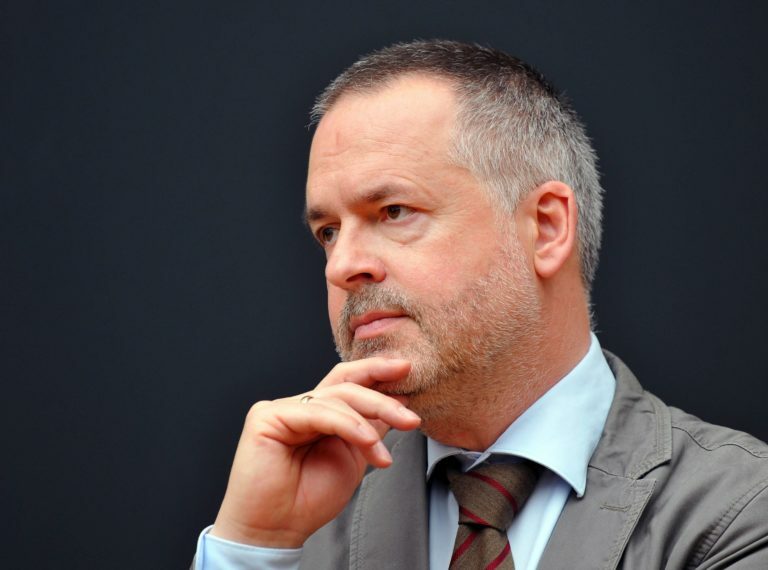 The director of the British Museum, Mr Hartwig Fischer, recently defended the historical theft of the Parthenon Marbles dubbing their removal a “creative act”. His comments again reinstated that they are the legal owners and have null intentions of returning or even loaning them to Greece. A stance far from new, his statement has enraged many advocates for the repatriation of the Marbles around the world. Greece and Britain have been in a centuries long argument over this collection of majestic sculptures formerly adorning the exterior of Athens’ Parthenon, now a London exhibit. Since its independence from the Ottoman Empire in 1832, Greece has repeatedly requested the marbles’ return, yet its plea – including those of other countries like Nigeria and Ethiopia from where Britain has looted significant cultural heritage treasures – has been denied. “When you move cultural heritage into a museum, you move it out of context. Yet that displacement is also a creative act,” Mr Fischer said, sparking rebuke. 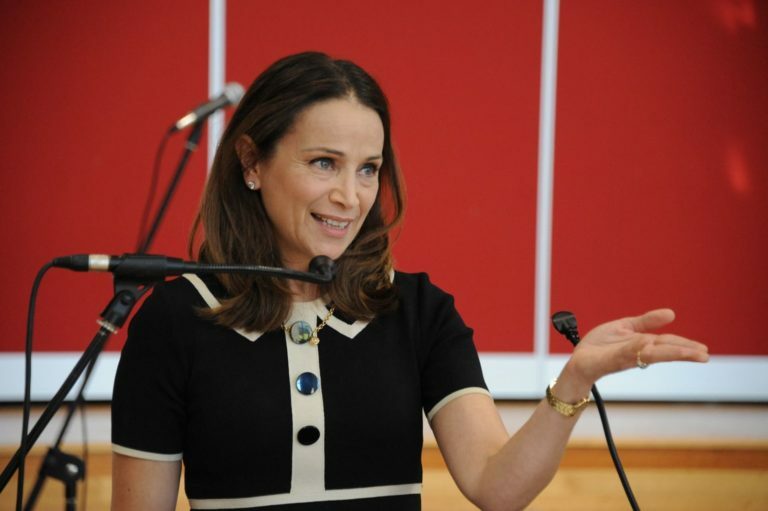 Myrsini Zorba, the Greek culture minister, issued a statement on Saturday condemning Fischer’s “legitimate owner” comments as exhibiting “a narrow and cynical managerial mindset”. “It is regrettable to hear this by the director of the British Museum and a well-known art historian. His remarks downgrade cultural heritage from an invaluable universal value to a mere exchange sale,” she concluded. In the last decade, Greece has intensified its advocacy for the return of the marbles, and it has always been met with the same arguments, the main pillar being Britain’s legislation banning its museums from disposing of their collections followed by the ever-long response that deems Athens a non-suitable place to preserve the marbles. Following the opening of Acropolis Museum in 2009 that second argument has been weakened, nevertheless, the British Museum’s position that they are the sole rightful owner of the Marbles is rather intransigent still. Of the many lobbyists working tirelessly across the globe toward seeing the return of the Marbles to Greece, a few Greek Australians have managed to shake the waters garnering immense support. Amongst them, Vice President of Australian Committee for the Return of the Parthenon Sculptures, Elly Symons who believes that Hartwig Fischer’s comments are inflammatory, not because they come as a surprise but because they come as proof that the museum is unwilling to even conceptually think about giving them back, let alone engaging in conversation. “It will never go anywhere like this,” she stresses while recounting Greece’s 2013 efforts to bring back the Marbles through UNESCO. Expressing the Australian Committee’s stance on the matter, Mrs Symons argues that it is high time Greece found a more assertive way, by seeking international intervention and support from other European Union countries to apply more pressure to the British Museum. “There are a lot of well-meaning people in the lobby of support around the world that believe that cultural diplomacy is the solution,” she explains. “But they’re hopeful that engaging in discussion and hearing arrangements and finding solutions are going to be fruitful but they constantly prove that they have not changed their position. They are firm in their stance that they will keep them, they say that they own them, that they have clear legal title and they don’t. We have to find another way to demonstrate that. Greece needs to get better at articulating the arguments on the international stage. Get other foreign ministers, lobby harder at state level. That’s what the British Museum does, it downgrades the issue to museum and culture ministry heads. We need to be more strategic in our tactics,” she stresses. In saying that, Mrs Symons feels that the Greek government has been very passive for a long time and has not carefully investigated the British Museum’s legal claims, in order to build a case alongside other countries as one of the reasons the museum is so adamant about not opening the Parthenon Marbles debate is that it would spiral an avalanche of issues, as Greece would then constitute a precedent for other countries in similar arguments with Britain. “The fact that they claim they have clear legal title, that’s the first fallacy. The second is that they keep perpetuating is that they’ve rescued them [the Marbles] in a way – a lie- and the other half is that Elgin didn’t hack off the buildings,” Mrs Symons notes. “They keep repeating their position that the British Museum is a safe space where international cultural treasures are being showcased for everyone to see, but they haven’t even taken proper care of them. They actually damaged them in the 30s and the 40s, they cleaned them with hard brushes, and they bleached them. They’ve been damaged in the museum; they’d been displayed in a terrible gallery. The artwork was one whole; the Parthenon, tells one story of Athens; it was one narrative that’s been dismembered. Imagine the Mona Lisa or Michelangelo’s David being chopped in half. It’s unimaginable,” she continues. Indeed, Mr Fischer claims that “the rediscovery is obviously part of European history,” and that “the museum shows the sculptures in a context of world cultures highlighting achievements from all over the world under one roof, and showing the interconnectedness of cultures”. He even went as far as to state that the monument’s history is enriched by the fact that some [parts of it] are in Athens and some are in London where six million people see them every year. 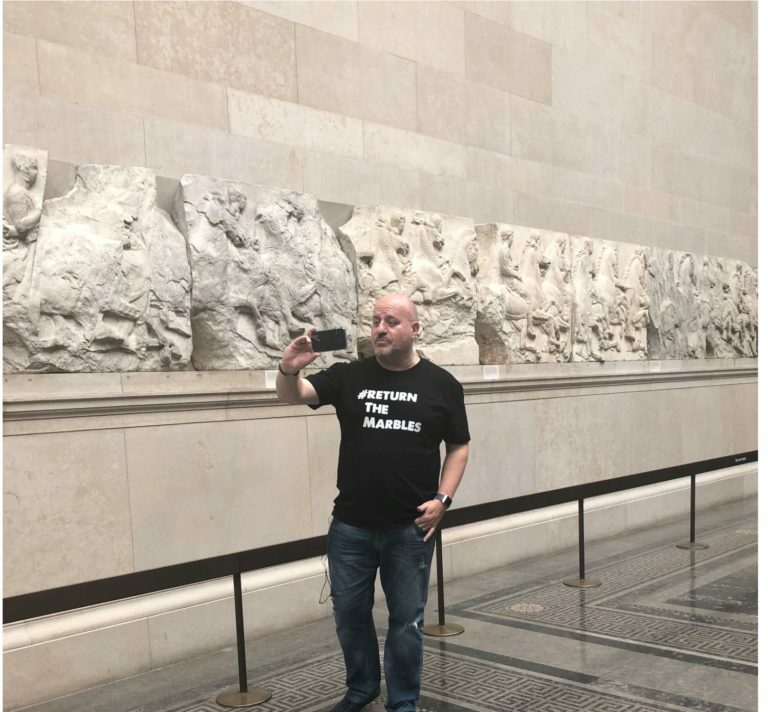 Less than a year ago, Melbourne barrister Jim Mellas staged a silent protest at the British Museum; his video went viral, and since he has created a community of over 12,000 members requesting to ‘Reunite the Parthenon’. Following up on Mr Fischer’s interview he too had certain points to make. “I disagree with his argument that the British Museum is showing the Parthenon Sculptures in a context of world cultures. The universal museum argument has been discredited over a number of years,” he tells Neos Kosmos. As upset as he might be, Mr Mellas is not at all surprised by Mr. Fischer espousing what has been the position of the British Museum for decades. “As the Director of the Museum he and the Trustees do have an obligation to preserve the collection in its entirety, so that things that are part of this collection remain part of this collection. It is correct that the the British Parliament though an Act of Parliament transferred the responsibility for Parthenon Marbles as well as other collections to the Trustees of the British Museum. Therefore they have a fiduciary responsibility to preserve the collections for future generations. That is what I would expect the Director or any of the trustees to say,” he says. However, he is adamant that the Marbles were not simply “displaced”. “Lord Elgin destroyed, vandalised and looted the Parthenon. At the time The Greeks were occupied by the Ottoman Empire, Elgin alleged he had permission to take them but could not produce it when he sold them to BritishMuseum. A study by British historian William St. Clair, Lord Elgin and the Marbles, written in 1967 concluded that all Elgin had was permission from the Ottomans to make sketches and casts of the Sculptures and Friezes and to to take stones found in the excavations conducted on the site or that had fallen for the Parthenon. He did not have permission to take any items from the actual Parthenon. Instead Elgin and his associates sawed off extensive parts of the Parthenon. In effect, he sawed off almost half of the Parthenon. This can only be described as barbaric, looting and vandalism on a grand scale,” Mr Mellas explains. “His intentions were not to take the marbles and give them to the British Museum but to display them in his home in Scotland. His wife who came from a very wealthy family wanted them. He had not even been to ATHENS at the time (though he did later visit) – he sent his crew to do the damage. One of the ships transporting the marbles to Greece (the Mentor) sunk off the coast of Kythera and the marbles it contained were at the bottom of the sea for almost two years. It was only after his divorce and bankruptcy that he offered to sell them to the British Government. In 1816 the British Government after extensive debate voted 82 to 80 to purchase the Parthenon Marbles. Many who voted against believed that the Parthenon Marbles should be returned to Athens, amongst them Lord Byron, a philhellene who was very passionate about the issue. Where Mr Mellas believes the director offered no argument, was in relation to the views of the opposition leader Jeremy Corbyn and his pledge to return the Parthenon Marbles to Greece if he becomes Prime Minister. The British Government can pass legislation to amend the current act and make provision in the act for the Parthenon Marbles to be Returned to Greece. The trustees only have the power -or fiduciary duty- regarding the Parthenon Marbles whilst the Act remains the same or whilst they have the support of the British Government. When asked about the risk that the British Museum faces in sparking a worldwide movement for artefacts to be returned if the enter the debate with Greece, Mrs Mellas insists that the Parthenon Marbles are in a unique position. “For example the Nigerians have recently demanded the return of the Benin Bronzes, the Easter Islanders sent a delegation to demand the return of one of their Easter Island statues, Indigenous Australians have demanded the return of their artefacts looted or stolen during colonial times,” he says.